Genesis Engineering is a professional engineering consulting company that specializes in the design and integration of material handling equipment and systems. Our business solutions can be incorporated into many types of industries, and can be customized to work best for you. Losing time due to multiple changeover requirements? No longer with Genesis and TrakSYS™. Increase in run-time will directly lead to more production. With simple implementation, and Start Up Support, let Genesis help you while your business continues to run efficiently and effectively. Genesis Engineering has the experience to provide a full range of services, from Conceptual Design & Analysis to Equipment Design and Start Up Support. Genesis uses a large variety of programming languages, Operator Interfaces and Networks in order to provide our customers with the optimal solutions. Armed with experience in material handling engineering, system analysis, conceptual definition, and scope development, Mr. Gary Jenkins founded Genesis Engineering, Inc. in 1986. Gary’s vision was to develop a professional engineering firm that would be able to provide customers with the best solutions for their material handling system requirements. By placing the best interest of the customer first and keeping an eye on future needs, Genesis has been successful in developing unique and cost effective material handling solutions. Over the years the Genesis "Team" has expanded to include electrical and mechanical engineers, designers, programmers, and project managers. Our engineers have specialized in the mechanical layout, controls design and systems integration of finished goods material handling equipment. 1993: Established a St. Louis, MO office. 1994: Established a sister company, Kolinahr Systems, to manufacture pallet labeling solutions. 1998: Established a Los Angeles, CA office. Genesis Engineering was founded in 1986 in the city of Blue Ash, 20 minutes north of Cincinnati. The University of Cincinnati developed to Co-op program in 1906 and continues to be a leader in co-op worldwide. Genesis first partnered with UC in 1992 and continues to develop Engineering Students today. Kolinahr was founded in 1994 as a sister company to manufacture pallet labeling solutions. The Genesis professional group of engineers design systems and requirements for the material handling industry in various industries. 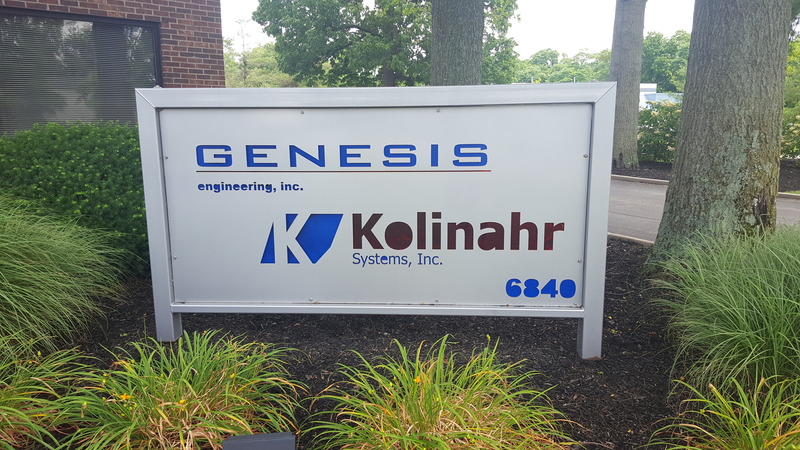 Genesis Engineering, Inc. / Kolinahr Systems, Inc. ©2009 All Rights Reserved.